9. Create citations and a bibliography. 1. A bulleted list is a group of related paragraphs with a special symbol appearing to the left of each paragraph. A numbered list is a group of related paragraphs with numbers appearing tot he left of each paragraph.. Select the text you want bulleted or numbered, click on the bullets or numbers buttons and display the list of options. Select one. a. Drag and Drop method. Select the text, press and hold the mouse button over the text until the drag-and-drop pointer appears, drag the dotted line to where you want the text inserted and release. b. Cutting, Copying and Pasting text- Select the text you want to cut or copy, in the clipboard group click the cut or copy button, place your cursor where you want the text to go, in the clipboard group click paste. c. Copy and Paste into new document: Select the text you want to copy, in the clipboard group click copy, click file, click new blank document, click create, click in the new document, in the clipboard click the text you want to paste into the new document, click paste options, select keep text only. 3. Finding and replacing text - to use the find command, click find or replace button on the home tab, type in the text you want to fine, click find next. To replace text, click on the replace tab of the find and replace dialog box, type in search text, type in replacement text, select a search option, click replace to find and replace each occurrence or click replace all. 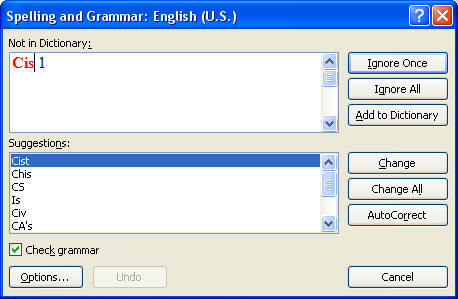 Respond to each word that is identified by the spelling and grammar checker. 5. A Quick Style is a set of formatting option that can be applied from the quick style gallery on the home tab. 6. Normal Style 11 point Calibri font, left alignment, line spacing set to 1.15. 7. Paragraph-level formatting - style set up to format entire paragraph. 8. Character-level formatting - format only a few characters. 9. To apply a style- place cursor on line to be stylized - click the more button in the quick styles group and select the style you want. 10. The document theme controls the variety of fonts, colors, and other visual effects available. 11. To apply a theme - Click page layout tab, click the Themes button in the themes group, scroll thru the themes and select the one you want. e. Add the page number (preceded by your last name) in the upper-right corner of each page. If you prefer, you can omit this from the first page. 16. Right Indent Marker looks just like the hanging indent marker except it is on the right side of the ruler. 17. Page Numbers - move to beginning of document, click insert, in header and footer group click page number, point to top of page and a gallery of page number styles.Select the style you want and then type your name with it. 18. 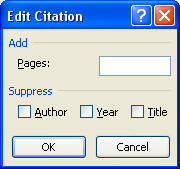 Bibliography - list of works cited known as sources - citation every time you quote. If the sentence does not include the author's name. the citation should include the author's name and the page number. The opening scene of the movie has been compared to a scene from Shakespeare (Peterson, 188). 20. Select the type of source, type in author name, type in title of book, type in year, type in city, type in publisher, click ok.
22. Edit the citation as you see fit. 25. Update bibliography: click in the works cited list, click update citations and bibliography. 26. Convert to static text and format MLA. - click bibliographies, click convert bibliography to static text. 27. Methods for selecting text.